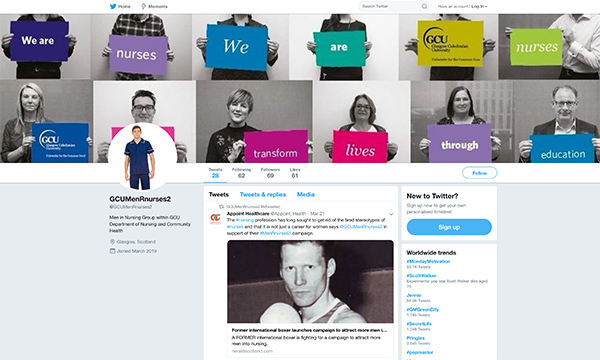 The @GCUMenRnurses2 campaign Twitter page. University staff have started a Twitter campaign to attract more male nursing undergraduates. Glasgow Caledonian University (GCU) staff came up with the idea of the @GCUMenRnurses2 social media campaign to appeal to a younger audience. Nursing lecturer Stevie Morrison said they wanted to reach as many young people as possible to break down nurse stereotypes. GCU said 8% of its 1,844 nursing students are men, with a 1.4% increase this year. This is line with a general increase in male nursing students in Scotland in 2019. Universities and Colleges Admissions Service (UCAS) data revealed an 11% increase in male applicants to nursing degrees in Scotland to 410 this year, up from 370 last year. But this is still well below the number of female applicants – 4,840 women applied to study nursing in Scotland in 2019. A total of 3,440 men applied to study nursing in the UK as a whole in 2019, compared to 37,750 women. However, not everyone is a fan of male-focused recruitment campaigning and the RCN's 2018 congress rejected a call for a strategy targeting men. According the latest data from the Nursing and Midwifery Council, about 12% of 693,618 registrants are men.